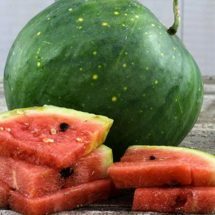 This great summer treat is even better when you grow it yourself. 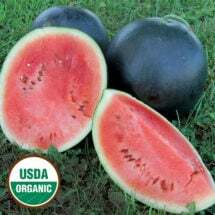 Plant heirloom watermelon seeds in well-worked soil under full sun after all danger of frost has passed. Give them plenty of room and keep them well-watered. When the melon responds to a rap from your knuckles with a good resonant thunk, it’s ready! 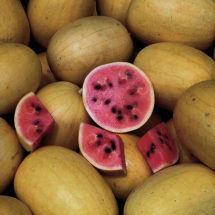 The flavor is superb, being very sweet and luscious; and the texture is crisp. 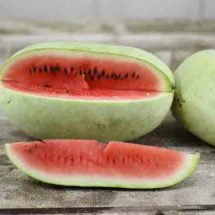 Sweet, juicy and crisp! Round 9-inch dark green fruits weigh between 6 and 12 pounds. Golden Midget has a built-in ripeness indicator: fruits turn yellow when ready. An attractive dark green variety with bright yellow spots that range in size. 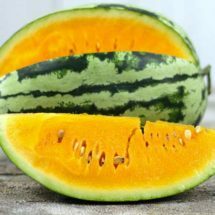 Beautiful, deep orange flesh that is very sweet and has an almost tropical flavor! 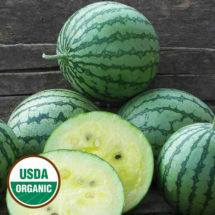 A deliciously refreshing small “icebox” variety — perfect for farmer's markets! 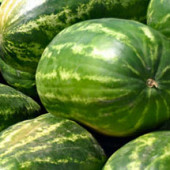 First introduced in 1923, this Southern favorite with sweet flesh averages 30 pounds.